What would happen to Spain in case of Catalonia’s secession? In terms of the debt sustainability parameters laid down by the Treaty of Maastricht, it’d be the Eurozone debt crisis 2.0. As Spain now maintains the second year of 3% GDP growth, an even bigger, immediate fiscal threat is looming. After multiple ineffective referendums in the previous years, this time the Catalan government is likely to finally assert independence. What will it look like against the background of the Maastricht financial requirements? Catalonia leaves without taking any share of the total Spanish debt. In the first case, nothing would change, assuming Catalonia would agree to take the share of Spanish debt equal to its share in Spain’s total GDP. In that case, Catalonia accounts roughly for 20% of the Spanish GDP, which means it would take 20% of the Spanish debt. Given that the Spanish debt is right now almost the same size as the Spanish GDP, calculations are rather simple. The second option is rather dramatic. 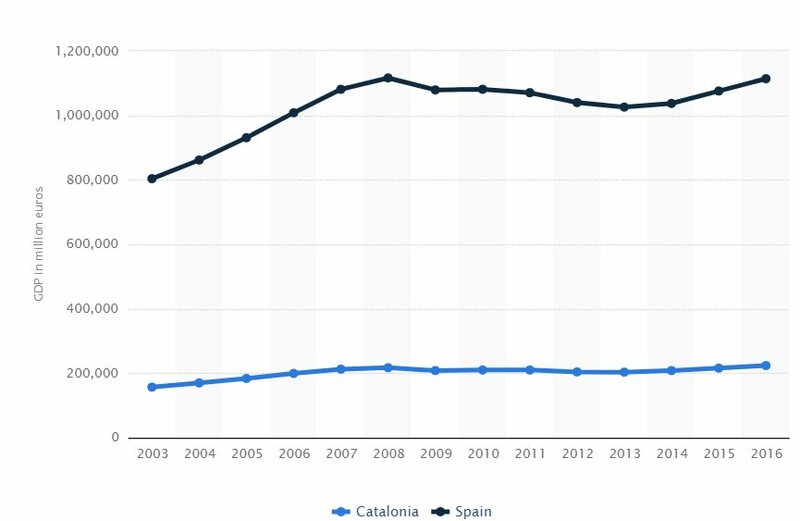 Without Catalonia, Spanish GDP would automatically shrink by 20%, while having to service the entirety of the debt. The debt to GDP percentage ratio would go from 99.4% to 124% overnight. The Treaty of Maastricht says it should be 3%. Spain has been way outside it since the financial crisis, with a peak at 11% in 2011. For 2016 it was 4.5%. Here the problem is understanding how much more tax revenue Spain gets from Catalonia than it gives. Catalonia says 11.1€ billion, Spain says 8.5€.1)Catalonia referendum: Does the region want to leave Spain?, BBC 2017-09-25.Either way, as the deficit is calculated as expenditure minus revenue, it would be a hole in the revenue of the Spanish government of 8.5 to 11.1€ billion. Last year the deficit/GDP ratio was 4.5%, corresponding to approximately 50€ billion. With the Catalan secession, assuming a 10€ billion hole for simplicity between the estimates of the Spanish and Catalan governments, Spain’s deficit would go up to 60€ billion2)The deficit GDP ratio is 4.5%. The GDP is provided in the chart, around 1113 billion. If defict/gdp=4.5 then deficit/1113=4.5% Then reversing the equation: deficit=1113/100×4.5=50 (current budget deficit in billions of euro, not percentage) 50+10 (the additional missing revenue from Catalan independence)=60 , while its GDP would shrink by 20%. Result? The deficit to GDP percentage ratio would be 6.7%, back to 2013. The doomsday scenario would be Spain waking up with a debt equal to 124% of its GDP and growing, due to the 6.7% deficit, which would take another 4-5 years to be contained. The EU’s response to the possibility of Spanish bankruptcy would be predictable: more austerity. It is important to note that while Spain has been growing for the past two years and unemployment is also decreasing, the recipe chosen by the Spanish government, flexibility of the labour market in the form of temporary jobs, has exacerbated income inequality:3)IMF: Spain’s richest 20% earn seven times more than poorest 20%, El Pais 2017-01-31. as the OECD points out that temporary jobs are low-productivity and thus earn low wages; the precariousness of the job prevents improvements in productivity, thus improvement in wages. The poor remain poor, while the rich get richer and the gap widens.4)Why Is Spain’s Recovery Not Reaching Wage Earners?, The Corner 2017-03-15. Boosting GDP and employment statistics with mini-jobs is thus masquerading an issue common to other Western countries: the collapse of the middle class. 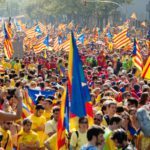 Catalan independence could prove to be the last nail in the coffin: either Spain goes bankrupt or is forced to implement even more austerity at the risk of facing a revolution from the economically displaced. 1. ↑ Catalonia referendum: Does the region want to leave Spain?, BBC 2017-09-25. 3. ↑ IMF: Spain’s richest 20% earn seven times more than poorest 20%, El Pais 2017-01-31. 4. ↑ Why Is Spain’s Recovery Not Reaching Wage Earners?, The Corner 2017-03-15. 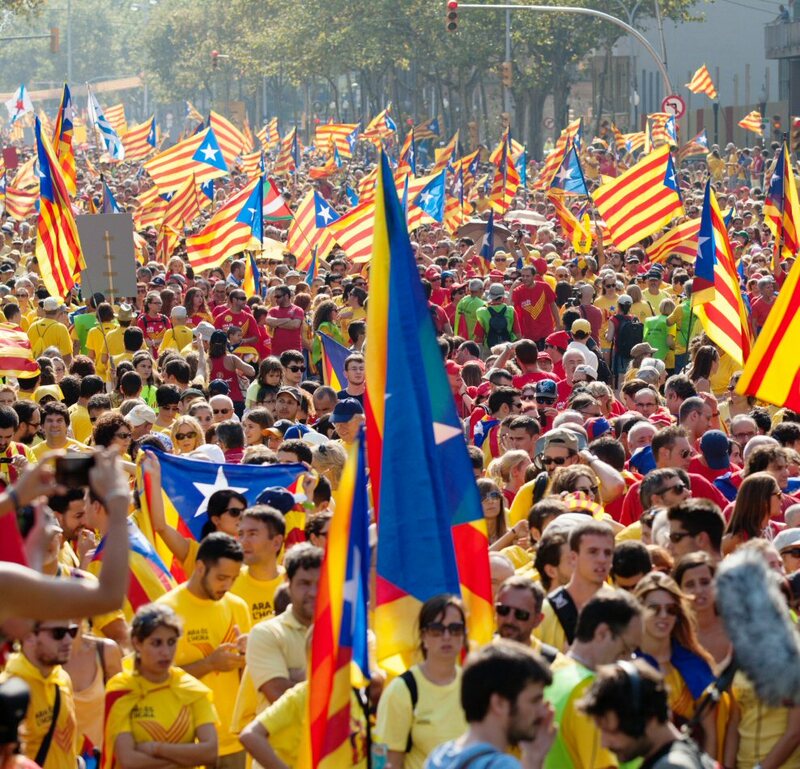 Catalonia is “The Straw That Breaks The Camels Back”, – of the E.U. ; as the PIGS of Europe implode. Your calculations overlooked a very important consideration. A great majority of industry had announced there intention to relocate outside of Catalonia, into ‘Spain’ should Catalan split from Spain. The economic backlash to Catalonia would be horrific. I have lived thru the Quebec ‘threat’ to separate from Canada and that alone has hurt the Quebec economy immensely. I cannot imagine the impact had Quebec actually separated. Spain may be favoured in the long run if Catalonia chooses to split. Frankly the Idea of Catalonia not taking its share of the debt is also just a ridiculous and the fundamental reason Spain has taken a hard line against allowing a referendum. That’s like a couple divorcing and one spouse telling the other “you can keep all the accumulated debts to yourself”. Never going to happen. Not a well thought out article, but thank you for your view. Thanks for your comment. You are probably right as independent Catalonia would find itself into a legal limbo, outside the EU, with Spain more eager to block Catalan access the more it suffers from the financial consequences of Catalan independence, thus hurting Catalonia economically as business stay away from uncertainty. Additionally, Spain bailed out the Catalan banking sector not long ago and we suspect Catalan banks are still not in a safe situation. Nonetheless, we preferred to stick to one simple, yet dramatic detail for our article, which is why we suspect the European Commission is now siding with Rajoy and its government; if Catalonia leaves, it’d be another major financial storm for the EU, and they can’t take it. Alberta like Catalonia.. maybe they’re better off without the rest of the country .!! I believe that everything should remain more or less the same but with a Signed agreement with Madrid that says they can have their own Government but will trade with Spain via the EU that will help support both economies. Will it work though, or will sour grapes put the Kibosh on all that Catalonia tries to do and dig themselves into an abyss? Catalonia could use Spain as their ‘Wholesaler’ and trade that way, whilst Spain introduces some Tariffs on trade to try to offset their economic shortfall which could prevent Spain from going Bankrupt. The EU won’t want to trade directly with the Catalan’s because it’s going to disrupt further, the ‘European Dream’ of their ‘Fourth Reich’ and overall control of Europe. Transitional Tax Rises over 5 years may help and additional Austerity measure will be put in place, but it MUST be a little often so it doesn’t upset too much, the Spanish people but I think by now, they will expect it. Spain’s debt is Toxic, so in order to survive, these measures will need to be implemented quickly. If it gets out of hand, the potential for significant and ongoing Civil unrest will ensue on and ongoing basis until Spain and Catalonia can compromise. What we don’t need to see is another ‘Basque’ style group to form and start taking a pop at the Catalan’s until they reunite, if that’s possible?